And so we come to the end of another year. It is fair to say that this has been one of the biggest in our 23 year history. We have seen the development and implementation of new programs, both in Perth and in regional WA, our organisation has grown and we have been awarded for our work in creating inclusive communities. But as I have said before, we are not ready to sit back and be happy with what we have achieved, we will continue to learn, be challenged and look critically at what we have done and where we are headed, to ensure we are always offering the best possible services to those that we work with. Thanks again to all those that have supported us in 2012 – a lot of our success can be attributed to you. We receive many in-kind donations, sponsorship and funding from a range of government, corporate and local businesses and we thank you for believing in what we do and continually backing us. And most importantly, thanks to the people that we work with. You make coming to work each day a pleasure and a challenge, so thank you. On behalf of our board and staff, I would like to wish you a fantastic Christmas and New Year and we look forward to working with you in 2013. Inclusion WA was thrilled to win three awards for their work in the inclusion of people with disabilities in the community on December 5 at the Count Me In Awards function at Crown Perth. Inclusion WA, in partnership with the Disability Services Commission, is pleased to be offering an Inclusive School Holiday Program to the town of Northam this January, following a successful community consultation there in November. In November, The West came out to shoot a little video of our Youth Connect Program – to celebrate inclusion as part of Social Inclusion Week 2012. The video highlights two stories from the highly successful program, Gio’s story and Ricky’s story. You can read more about Ricky’s story in the Member Story section below. Social Inclusion Week wrapped up at the end of November and it was great to see more events than ever. We are looking to make Social Inclusion Week 2013 even bigger, if you would like to be involved, then read on! Ricky began the Youth Connect program in April 2012. Ricky is 14 and a great guy, he loves being active and has a keen interest in sports, skateboarding and trains, but was often very shy. Ricky was looking for a regular activity to attend outside of school, with other kids. Ricky was really keen to get involved in skateboarding, so we found a youth centre which was involved in street art at a local skate park. Ricky didn’t enjoy the ‘art’ side of skating so much but enjoyed the social aspect of the youth centre. After a bit more research, Ricky and I found skate lessons run on Saturdays at the YMCA HQ open to anyone. The first time they went to check it out, the coach, Nathan, immediately welcomed Ricky and told him about the lessons and how long he’d been skating. Once the lessons began and Nathan had shown the kids a few things he could do on a skateboard, Ricky was mesmerised, but still was quiet in the first part of the lesson. Jeremy encouraged Ricky to give everything a go and talk to the other skaters and as the lesson went on Ricky became more involved and had a lot of fun. The participants are all eager skaters like Ricky and they all get involved in the diverse exercises Nathan runs. They even combined two of Ricky’s interests and played basketball on skateboards one lesson. Ricky has been regularly attending the lessons and has successfully completed tricks and manoeuvres he previously couldn’t. Before joining the lessons, Ricky would only begrudgingly attempt to ‘drop-in’ to a half-pipe, but know has successfully done so on a number of occasions. Ricky’s self-confidence has grown as he is being encouraged to give things a go and finding that he can succeed. 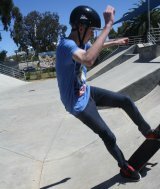 He is becoming friendlier with the others in the lessons and enjoying being part of a thriving skateboarding culture at the YMCA. Promote and Maintain Motivation. This workshop brings together various theories on motivating the seemingly unmotivated and provides a brief background and role play on “Motivational Interviewing”.